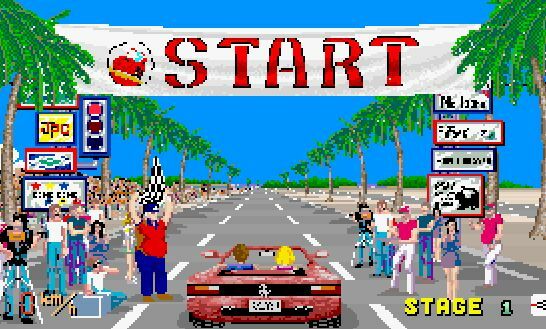 With the recent release of Outrun Online Arcade I felt it would be a good opportunity to look back at the heritage of the series and the aspects of this title that continue made it a classic loved by fans of the genre to this day, besides my own personal and reflective take. Outrun was originally developed by Sega Amusements for the arcade in 1986, a time when the vast majority or racers were either top-down view such as the Sega’s Monaco Grand Prix or simplistic 3D in the form of Namco’s Pole Position. The objective was simple, to take your girlfriend for a drive in your swanky new Ferrari Testarossa and go as fast as you can making sure in the process that she’s suitably impressed with your manly driving technique. Though for the eagle eyed of you, you’ll notice it’s not actually a Testarossa at all, Sega did not secure the official Ferrari license and opted for a cheeky duplicate, certainly not something a developer could get away with today, with the 2003 release of Outrun 2 featuring the full Ferrari license. Developed by legendary designer Yu Suzuki, Outrun grabbed the attention of on-lookers with its bright bold and colourful graphics, while providing an exceptional interpretation of speed using Sega’s Super Scaler technology to great effect. As discussed within our feature The Art of Racing, the visual approach was one which dominated the era, the colour palette used within the new generation of Japanese developments giving games a bold and happy feel. The music too was a perfect fit, with this game being the first to give a player the opportunity to choose which track they would prefer to drive to. Sega were obviously very pleased with the result and even went to the extent of including an audio cassette with the home conversion featuring the full soundtrack, this meant players could play the actual theme tune rather than listen to the often appalling chip generated conversions. I have to admit I missed this cassette edition and had to suffer with the best my Amstrad CPC 464 could manage, which was rubbish. So you’ve got the car, you’ve got the girl, now you need some serious speed and Outrun provided that in buckets, this involved driving recklessly fast on open roads through a wide range of environments split into sections with timed checkpoints. Toward the end of every stage the road would split into two, with the left track pointing to the easier section and the right to the harder more complex routes, fail to reach the checkpoint in time and it was game over. The in-game environments covering pretty much anything you can think of and with some of the tightest time limits ever in an arcade racer it was certainly challenging and on my first impression intimidating too. The furious speed and vicious crashes conveyed through the force feedback really made this a somewhat nerve wracking rush with a high level of skill and concentration required in reaching the games 5 route destination goals. Though I confess I never did manage to reach the goals, Outrun was always more expensive to play than any other cabinet and a tad costly for repeated play. However reach new territory and you could quickly attract large crowds, every section was a journey of discovery, it seems silly by today’s standards but the change in background colour really did cause an awful lot of excitement. Outrun immediately became a classic of the arcade marketplace, this was an era when the arcade experience far exceeded that of home systems while representing the beginning of a new era which would prove to be a magical and exciting experience for arcade goers, with cabinets ever increasing their complexity in making that experience as inclusive and immersive as possible. 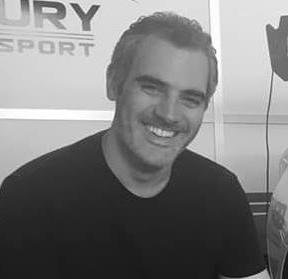 Outrun pushed these boundaries yet further with AM2 leaving no expense sparred in their realisation of cabinet design resulting in the first ever force feedback steering wheel and moving cabinet, a revelation in design, a revolution in execution and an evolution of the experiences arcades were going to be expected to provide. Between the mid 1980’s and early 1990’s arcade technology would continue to strive forward and provide experiences way beyond that of home systems, the difference between the arcade and home conversion being poles apart. The Outrun conversions suffered too, often woefully inaccurate to say the least, some lacked sound while others lacked colour but all lost that critical feeling of speed. But this didn’t stop the title selling as Sega maximised their in-house development with the world’s first home conversion of the title to their Master System format in 1987, simple yet effective and highly impressive for the time. Outrun was a benchmark and though I loved the arcade experience, the home conversions never did it justice. Most were also impossible to complete, but despite that, it didn’t stop me trying and I was always being hopelessly conned when it came to box art, often screen shots of the arcade Atari ST and Amiga versions would be pictured on the back of the Amstrad, Spectrum and Commodore conversions with the now classic phrase “screen shots from various formats”, but it never stopped me wishing for better. We've taken the time to find a few helpful videos, the first represents the original classic arcade machine in its original guise, the two offer a glimpse of the kind of conversion to the home you could have expected in that era, suffice to say gamers today have never had it so good.